This small book and stationery store in the basement of a newly painted old building is located close to Trinitatis Church with its grand circular tower. Meaning that if you plan to roam the stores of Copenhagen's city centre, you will inevitably pass this bookshop on Landemærket, too. That is how we, too, discovered Cinnober: during a lovely stroll through the city's magnificent historic district. Owned by graphic designer Ulla Welinder and illustrator Morten Voigt, the store opened its doors about six years ago. 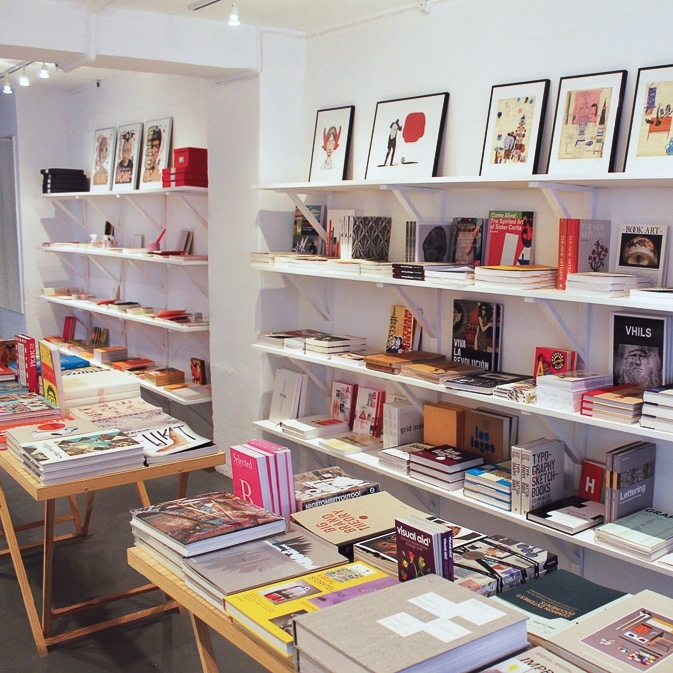 In line with their passion, the two owners display carefully selected books on the subjects of graphic design, illustration, architecture, street art, fashion and industrial design. They also offer a small selection of limited and signed prints by Danish illustrators as well as an assortment of stationery. Every book you see passes through Ulla's and Morten's hands first. Each edition is carefully picked, and only that which inspires and truly pleases will make it into the line of goods. Something that you'll absolutely notice once you approach the tables of books as you'll find yourself touching and taking each one into your hands, unable to decide which one you like best. Seeing international books and magazines for the most part, we're able to spot some pieces by Berlin Gestalten Verlag as well as hand-printed postcards, classic writing utensils, portfolios, notebooks and countless other whimsical accessories for your home office. We also found out about an existing online store that, so far, only carries a small selection of the product line though. So do make sure to stop by in person!